Tuesday saw a sudden sharp increase in my book supply. 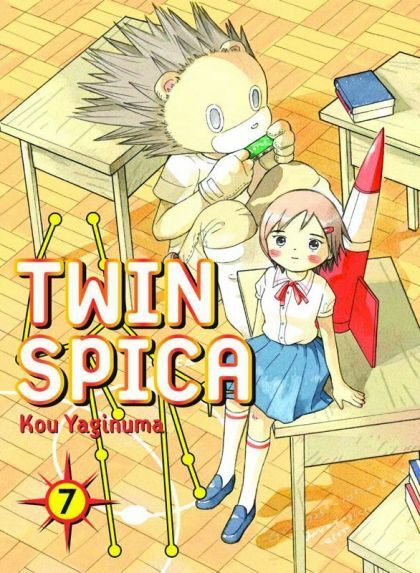 Volume 7 of Twin Spica , the best manga about astronaut school there ever was, came in from Right Stuf yesterday. Which means I immediately sat down and did nothing else until I finished it. I also bought two books from the used bookstore, Anansi Boys by Neil Gaiman and The Grass Dancer by Susan Powers. I’ve only read two other Neil Gaiman books before, American Gods and The Graveyard Book, but I loved both of them, so I was excited to find this book. Grass Dancer was a suggested reading for one of the seminars I’m taking next week, so I figured I’d get a few pages read before I showed up. And then, while I was reading Twin Spica UPS arrived at my door with a package from Yen Press! I received my review copies for A Bride’s Story by Kaoru Mori, the author of Emma, and the latest volume of Black Butler . Reviews for those should be up within the next month. Oh, cool! Where would your reviews go up?